The Conecuh National Forest, established in 1935, covers a large portion of the southwestern corner of the county. The Conecuh River runs through the western area of the county, and its tributary, Patsaliga Creek, runs through the northwestern section. Every year the town of Opp stages Oppfest, an arts and antiques festival held during the last weekend of October. Nothing less than reports of hellhounds, a shrieking banshee and whimpering from inside Consolation Church, also known as the Oakey Streak Methodist Church. Legend and the local rumor mill is that local family ancestors and visitors to Red Level have for decades told that the church was abandoned long ago due to circumstances that could not be controlled. Generations of residents have told tales of human possession and driverless trucks around the church and graveyard. Reports from paranormal investigators and statements from visitors passing through the area of the church have been documented and all claim that they have been touched by spirits when they asked for a sign from beyond the grave. The church burned in 2015 but confederate soldiers and a little boy and girl are said to still haunt the graveyard. 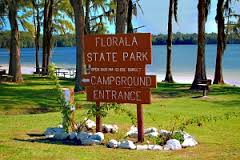 Florala State Park is a 40 acre park that stretches along the 500 acre Lake Jackson, it offers camping, picnicking, playground, swimming, fishing, trails and paddleboat rentals. Water skiing and personal watercraft are allowed on the lake.